What Makes Attorney Garo R. Madenlian Uniquely Qualified To Represent You? Garo R. Madenlian, Esq. 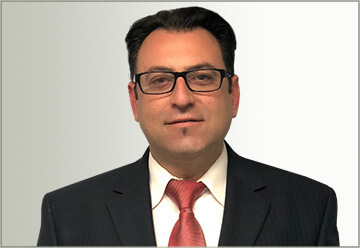 is a partner at Kevorkian and Madenlian LLP with years of experience as a Deputy District Attorney where as a prosecutor he honed his trial skills and secured impressive results with numerous jury verdicts in his favor. He now uses this real-life experience and insight gained as a DA to serve and vigorously defend the rights of those he represents. He is always available for his clients and is committed to restoring their lives. Madenlian focuses his practice in the areas of criminal defense and personal injury. He aggressively and passionately represents individuals accused of committing crimes, as well as those suffering injuries caused by another, such as automobile or motorcycle accidents, slip or trip and falls, or wrongful death cases. His other practice areas include employment law, family law and living trusts. He is also of counsel for a local union and a number of California corporations. Prior to becoming an attorney, Madenlian worked for over 10 years with the Los Angeles County Office of Education (LACOE) as a motivational speaker conducting workshops and empowering people to be successful positive minded and goal oriented action takers. It was during this time that he decided to become an attorney. He graduated with honors receiving his Juris Doctorate degree from Western State University College of Law. In addition to being a partner at KM Law Offices, Madenlian also serves on numerous local and regional boards and non-profits including the Orange County Armenian Community Center, Mosaic Arts and Cultural Foundation, and the Armenian National Committee of America (ANCA). He regularly meets with elected officials and legislators in Sacramento and Washington DC to promote human rights, and social justice and equality for all people. In the past he has served on the Fountain Valley Traffic and Safety Commission, AGM Elementary School Board, AYF Central Executive, and the Armenian Cultural Foundation. Home » Garo R. Madenlian, Esq.